Reusable price tags - that are weather proof! No more soggy paper tags at outdoor shows. This is a very durable option - simply mark with a marker. Jewelry parts - they can be used as is as a part of any jewelry item. As part of a pendant, earring bracelet etc. Charms - use to make wine glass charms or anything else you can think of! Please email if you have a bulk request for a different material. Price ranges from 0.8cents US to 1cents US each. The hole size is 0.094'' (2.3mm - fits max 14g). We recommend using a 19g or 20g ring or our 22g split rings as connectors. This makes an amazing jewelery dangly bit! These are made from the holes punched out of our large scales - happy reuse/recycling! Price ranges from 1.80 cents US to 2.40 cents US each. Price ranges from 1.74 cents US to 2.40 cents US each. Price ranges from 3.1cents US to 4.1cents US each. The hole size is 3/32'' (2.3mm - fits max 14g). All are the same color on both sides. Special Notes: Please Note: The black tags in this mix are tiny tags not 1/2''. There was a mistake when bagging this product. This note will be removed when a new batch is made. This is not considered an error for returns or refunds since it is noted here. Price ranges from 4.1cents US to 5.5cents US each. The hole size is 3/32'' (2.3mm - fits max 14g) unless noted. Special Notes: Please Note: About 25% of this batch has holes closer to the edge of the scale. This note will be removed when this batch is gone. Price ranges from 6.62 cents US to 8.90 cents US each. Price ranges from 7.68 cents US to 10.30 cents US each. Price ranges from 5cents US to 6.6cents US each. The hole size is 1mm. Price ranges from 3.19 cents US to 6.30 cents US each. Price ranges from 22.50 cents US to 30.00 cents US each. Price ranges from 10.00 cents US to 13.40 cents US each. Special Notes: tags can have patina on them - this is normal and should be considered a feature. Price ranges from 12.28 cents US to 16.40 cents US each. Price ranges from 11.52 cents US to 15.40 cents US each. Price ranges from 10.8cents US to 14.4cents US each. Special Notes: Please note: This batch has a small mark by the hole on each scale. Price ranges from 12.4cents US to 16.6cents US each. Special Notes: BRIGHT anodized aluminum. These are made using SHINY material! Thickness varies from 0.022" to 0.05" based on material. It doesn’t affect the appearance. Price ranges from 9.92 cents US to 13.30 cents US each. Special Notes: These are covered in a protective blue plastic to preserve the shine during manufacturing and shipping. Price ranges from 12.38 cents US to 16.50 cents US each. Price ranges from 5.1cents US to 6.8cents US each. Special Notes: Please Note: these tags have a clear plastic film to protect them.Peel this film to see the full shine! Price ranges from 9.6cents US to 12.9cents US each. Price ranges from 808cents US to 1080cents US each. All specs noted here are for anodized aluminum - for stainless and titanium specs see listing below. Weight is ~9.5 grams each. Blanks will have a very slight curve to them, the corners are not radiused and edges may have a mild burr. All of this can be easily filed during your processing. 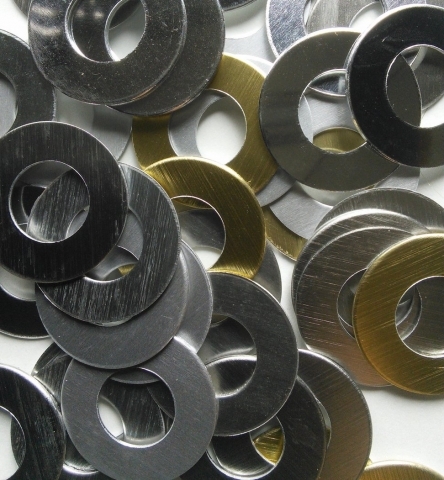 Anodizing is top quality US anodizing - the color will not fade or chip. These are perfect for engraving, pad printing, stamping, embossing, etching etc. Titanium are $55 for a package of 40 blanks. The price will be correct when you add it to your cart. Special Notes: Special Note these are 0.025" thick. These are $55 for 40 cards. Price is adjusted when you add it to your card. The anodized aluminum strip is 1/2 hard temper and is anodized the same both sides unless noted. The sides of the strip are not anodized. Excellent raw material for making bracelets and cutting your own shapes - let your imagination fly with this! Bracelets shown had the pattern laser engraved onto cardstock and then transferred to the strip with a rolling mill. The slight dishing (optional) was made with a shaped tool on a hydralic press. Final shaping was done by hand - literally - no tools. Please note: The length on these can vary slightly. Most are cut to 12.1" long. Special Notes: This strip is a bit cloudy - the price has been reduced 10%. This will show as a lower price in your cart. Special Notes: This strip is only 1.85' wide - the price has been reduced 10%. This will show as a lower price in your cart. 20g SOLID Niobium - 2" x 2" x 0.032"
Price ranges from 1,230.00 cents US to 1,230.00 cents US each. 22g SOLID Niobium - 2" x 2" x 0.025"
Price ranges from 1,232.00 cents US to 1,235.00 cents US each. Price ranges from 275.00 cents US to 275.00 cents US each. Price ranges from 102.00 cents US to 102.00 cents US each. Price ranges from 57cents US to 77cents US each. Perfect size for bracelets and cuffs! Please note: The length on these can vary slightly but all will work perfect for cuff style bracelets. Price ranges from 46.00 cents US to 61.00 cents US each. Price ranges from 190.00 cents US to 255.00 cents US each. Price ranges from 1050cents US to 1400cents US each.